SKOHRboard: Weekend Picks: Now With More NBA and Women's College Volleyball! 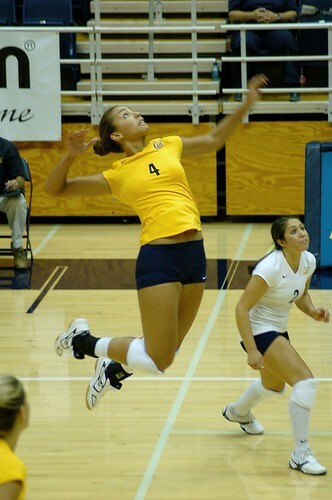 Weekend Picks: Now With More NBA and Women's College Volleyball! Bowl season starts this weekend but I can't really tell you to that there are any good match-ups which you should be watching until next Wednesday. So in light of that, SKOHRboard is now delving into the part of the year where we cautiously dip our toes in the usually frigid waters of December basketball. I'll do my best to find the hottest games for you though. These are two of the hottest teams in basketball this year and you should be watching because they're not only good, they're a lot of fun. The Heat have LeBron and Dwayne so it's obvious why they are a must watch but they have finally started putting the pieces together. The team is currently riding a 10 game winning streak to boot. The Knicks added PG Felton and C Stoudamire this offseason and they have clicked right off the bat. The NYK just lost to the Celtics after their own 8 game winning streak. There should be plenty of excitement in the Garden with all the stars in this game not to mention the trade talk of Carmelo Anthony heating it up even more. A COLLEGE FOOTBALL PLAYOFF!!! Villanova won it all last year and has made it back to the semifinals this time by upsetting top ranked Appalachian St. last week. Despite being unranked and 4 regular season losses they look like the team to beat right now as they square off against #5 Eastern Washington tonight. 'Nova is lead by Senior WR Matt Szczur who has been electric for the Wildcats for each of the last two years. Unfortunately for EWU their top tailback broke his foot in the quaterfinals but they are led by former SMU star QB Bo Levi Mitchell. Here is all I know about these programs. The Kansas St. Head Coach is one scary looking dude and I'm glad that I don't play for him. Both teams are ranked so it's a noteworthy game. Although UNC is unranked they are still a team to watch, at least as far as I'm concerned. Start watching some College Hoops to see who you're going to pick in March. Penn St. has won the last three Women's College Volleyball National Championships and they'll be playing for their 4th in a row Saturday night. They'll have to beat a California team that looked very good in their semifinal game against USC. Unfortunately for Cal, the Nittany Lions were close to dominant in their win over Cal. This match-up will also have a revenge factor for Cal as it was Penn St. that knocked them out of the playoffs both of the last 2 years. The National Championship game last season was one to remember. In the best of 5 series, Texas went up 2 games to none only to lose as Penn State rallied to take the final 3 and win the Trophy. The game of the week right here. Both teams are short on tie-breakers for a wild card spot so winning the NFC East is crucial and this game is as big as it gets. Vick will have his hands full with the Giant's potent pass-rush. This is really a make or break game for the Jets. They have looked absolutely terrible on offense lately and traveling to Pittsburgh isn't the easiest way to get out of a funk. Sanchez will really have to turn this around in this game and prove himself if the Jets are going to have much hopes of making the playoffs this season. Fortunately for him, it sounds like the Steelers will be without All-World Safety Troy Polamalu who injured himself while flying into the end-zone to cap off a spectacular pick 6 play last week. This game could be a great one of Aaron Rodgers is able to recover from a concussion he sustained last week against the Lions. Brady is unquestionably playing at the top of his game right now and it is going to take a great performance from the Pack to keep this one close.